My wife and I are retired Public School Teachers in Central Florida. Our Kennel and home are located in the countryside on several acres near Orlando. 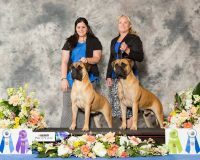 Bullmastiffs are our family and life. All of our puppies are our grandchildren and are raised as such. We want only the best placement for each pup and a positive experience for everyone.